Prominent & Leading Manufacturer from Mumbai, we offer stainless steel dressing trolley, stainless steel kitchen trolley and service trolley. 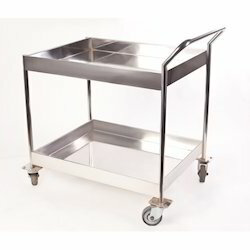 We are offering Stainless Steel Dressing Trolley to our customers. Constructed from stainless steel. Shelves with upstand on four sides, push handle, mounted on 80mm castors. Knock down. 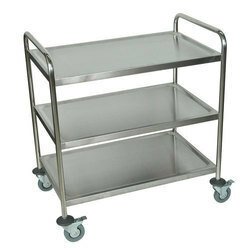 Due to our years of expertise in this realm, we are readily affianced in presenting an exceptional quality variety of Stainless Steel Kitchen Trolley. We hold industry expertise for offering premier quality Canteen Trolleys, which are appreciated by our clients for construction, mobility and reliability. These are manufactured using finest tools and other equipment under surveillance of our quality associates. Our quality associates are well-versed with technicalities and industry standards, and conduct tests and checks accordingly.